Attractive 5 bedroom top floor flat in traditional Edinburgh tenement, with high ceilings and decorative cornices throughout. High ceilings and decorative cornicing give the flat a real feeling of space and light. Ideal City Centre location, with the tree-lined haven of the Meadows on your doorstep, and with a 10 minute walk from both Castle and Princes Street. Cinemas, theatres, shops, restaurants and bars are all minutes away, as are golf, cricket, croquet, tennis courts, football, swimming and also children's play areas. Lauriston Gardens itself is set within a quiet street, and is within walking distance of all the Capital's historic attractions. There are three extremely spacious double bedroom and two single bedrooms. The master bedroom has large double windows, marble fireplace, decorative cornice, chandelier and a double sofa bed. 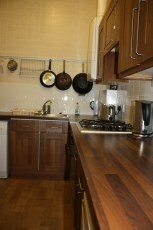 There are a further two extremely spacious double bedrooms and two single bedrooms. When sleeping 10 people, please note that 2 people will need to share a sofa bed and will not have a separate bedroom. This only applies to bookings of 10 people. The large bay windowed lounge has traditional wooden floors, decorative cornice, chandelier and marble fireplace, large flat screen cable television, DVD player, comfortable sofas and chairs, and spacious dining area with a solid birch dining table which seats 10 in comfort. The fitted kitchen has a fridge, freezer, electric oven, gas hob, microwave, toaster, kettle, coffee maker, washing machine and all crockery, pots, pans, cutlery and glassware. The bathroom has a full ceramic bath, arched mirror over wash-hand basin and a power point for shaving. The flat also benefits from a separate shower room. January to May: £250 per night. 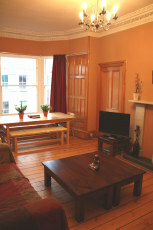 October & November: £275 per night. December (up to 26th) £275 per night. December 27th to 6th January: £330 per night. Please contact us for other discounts, ie longer stays etc. 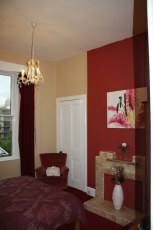 If you wish to check availability, or too book Lauriston Gardens, please click on the link below. If you have any further queries or questions, please contact Moira on 01471 822716.